Unable to connect to QuickBooks. 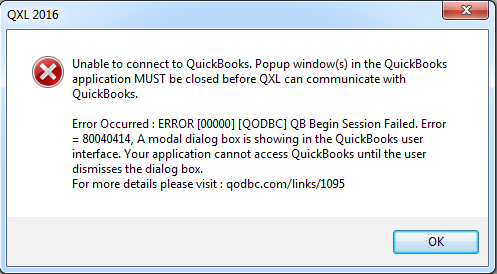 Popup window(s) in the QuickBooks application MUST be closed before QXL can communicate with QuickBooks. Error Occurred: ERROR  [QODBC] QB Begin Session Failed. Error = 80040414, A modal dialog box is showing in the QuickBooks user interface. Your application cannot access QuickBooks until the user dismisses the dialog box. Please navigate to QuickBooks & make sure that there is no modal popup window is open in QuickBooks. If any modal popup window is open in QuickBooks you will get an "Error = 80040414, A modal dialog box is showing in the QuickBooks user interface....". QuickBooks is simply saying that a modal connection is active for this part of QuickBooks and you need to wait. You need to close this modal popup window in QuickBooks & export data using QXL. QXL does not have control over a Modal Popup window in QuickBooks. QXL cannot suppress or bypass this type of dialogues. You need to disable modal popup from QuickBooks.